If you need something powerful to drive fasteners in or around the home, look no further than the Ridgid R82230N 12V Impact Driver. Its compact size allows you to bring it with you wherever you may need with maximum control, but its power rivals that of larger drivers. You won't want to go back to the other tools after using this one, though. Its LED lighting system lets you see where you're working, and the design of the lights prevents shadows being cast from the tool onto your driving subject. The rubber hex mold on the grip allows you to keep hold even in slippery conditions. That, in tandem with this tool's light weight and compact size, allows for maximum control and minimal fatigue on your end. You won't even notice how long you're working until the LED lights begin to blink, letting you know that your battery's run out. Keep it on your person with the reversible belt clip when it's not in use, or store it just about anywhere when you're done for the day. It's small enough that you'll be more than likely to find a spot where it'll be out of the way. For fastening jobs, you don't need an overpowering 18V impact driver, and with the features loaded into the R82230N, you'll forget that you're using something with smaller voltage. It's not surprising, though, coming from Ridgid. 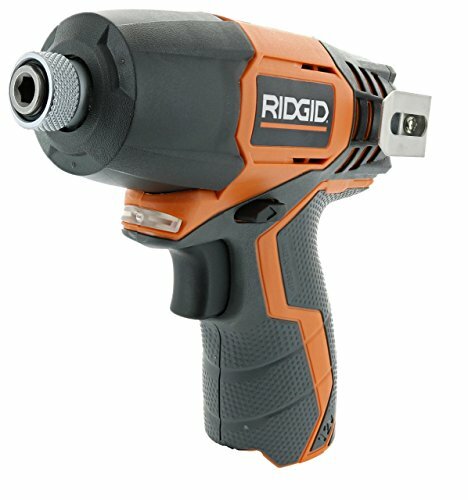 Ridgid does power tools right.